Toronto’s Small World Music Festival just celebrated its 17th edition. Inspired by WOMAD this year the event paid tribute to world music’s legacy and cultural diversity through film, conversation and music at various venues across the city including the Harbourfront Centre. 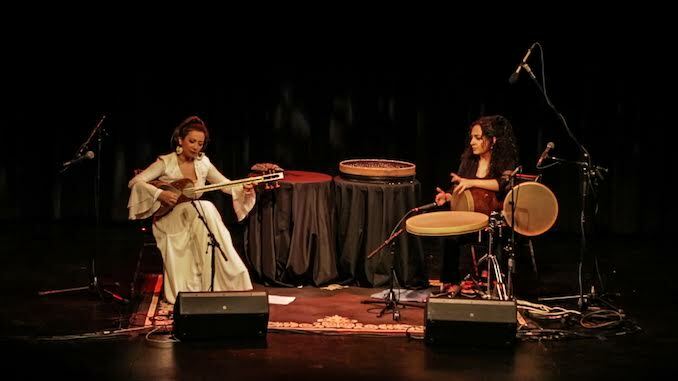 A program highlight was an instrumental Persian music performance by two supremely talented Iranian musicians, Sahba Motallebi and Naghmeh Farahmand. Internationally acclaimed musician Sahba Motallebi mesmerized a Harbourfront audience with her Persian music compositions played on the tar. She was accompanied by Naghmeh Farahmand a leading percussionist on daf and tonbak. The resulting listening experience was not of two instruments playing together, but the sound of hundreds. The dynamic show was instrumental only, much of the music was intense, driving and complex. Motallebi’s precise tar playing is both elegant and fearsome. On stage she has the graceful poise of Elizabeth Taylor in her prime; you feel like you are listening to a legend. During the concert all eyes were on Motallebi, including Farahmand’s, who accompanied with innovative drumming. Farahmand style is passionate and powerful; her bold beats could easily inspire awe from the Titans and Olympians. Along with some ancient Persian classics Motallebi played many of her own compositions taking time to speak to the audience about how Persian classical music intervals work, that Persian music can and is often improvised, and how her tar was made. She shared the inspiration behind each of her original pieces: the first day of spring, her children, the repression of artists and peace for instance. Together Motallebi and Farahmand delivered a sensational, atmospheric performance. They are both fabulous! Female musicians, singers and performers still have many limitations placed on them in Iran, for example women don’t sing in public and a girl taking her musical instrument out in public risks having it destroyed. It’s a shame to think about gifted women like Motallebi and Farahmand with limitations and restrictions put on them. To limit such talent is to rob the world of a most magical experience. It was a joy to see Sahba Motallebi and Naghmeh Farahmand perform at a Toronto music festival. They are welcome to play here anytime they wish, however they desire. Originally from Sari, Northern Iran, Sahba Motallebi is an internationally acclaimed virtuoso on the tar and setar; an award winning musician specializing in Persian classical music, folk and world fusion. At age 14 Motallebi attended the Tehran Conservatory of Music. She was recognized as Best Tar Player at the Iranian Music Festival for four years running. After graduating, she co-founded the groundbreaking women’s music ensemble Chakaveh. In 1999 she joined the Iranian National Orchestra, beginning her career as an international performer. She left Iran in 2003. Currently Sahba Motallebi lives near Los Angeles and continues to perform worldwide. Naghmeh Farahmand is the daughter of one of Iran’s leading percussionists, Mahmoud Farahmand, she started playing tonbak when she was six years old. She also trained on santur with Faramarz Payvar and Pashang Kamkar. However, Farahmand was drawn to the daf drum, and began learning Sufi and Kurdish rhythms from Bijan Kamkar and Masoud Habibi. 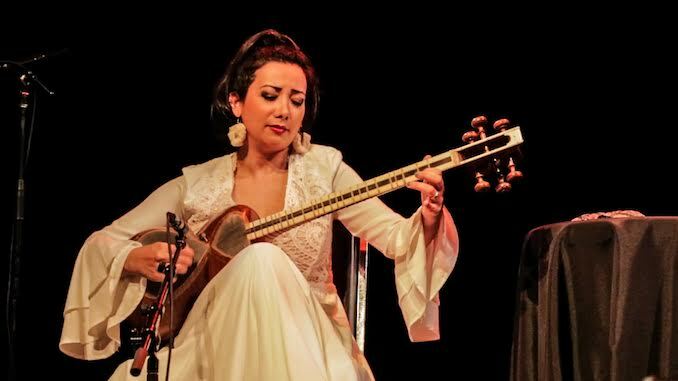 In her career Farahmand has performed in several acclaimed traditional music ensembles in Iran and at festivals worldwide with leading musicians including ney master Hassan Nahid and vocalist Hengameh Akhavan. In 2010 she moved to Canada and started collaborating with jazz and world musicians, eventually founding the percussion ensemble Sharghi. 2018’s Small World Music Festival celebrated the 30th anniversary of WOMAD (World Of Music Art And Dance), one of the world’s most influential global music events which was founded by Peter Gabriel. Sahba Motallebi and Naghmeh Farahmand’s performance was co-presented by Link Music Lab and Small World Music Society. It took place on Saturday, August 18, 2018 at the Harbourfront Centre’s Studio Theatre. One of the many performances at the 17th Annual Small World Music Festival, co-produced by Harbourfront Centre and supported by TD Bank.